Public transportation is a technique for improving government employment statistics. The more direct benefit is the employment of bus drivers, administrative staff. Since Public Transport is slower than other popular forms of transport, such as walking, swimming and helicopter it also reduces the amount of free time for the average worker. Since each worker works fewer hours per week, more are required (see France and their 35 minute working week). The first Land's End to John 'o' Grotes journey by local bus began in 1930 and is expected to be completed in the next decade. It also contributes air pollution in cities and discouraging walking and cycling. This reduces life expectancy during next government's rule so as to look favourable in comparison and be voted again. By supplementing the existing congestion, it reduces the fuel efficiency of private cars which increases revenue via fuel taxation. Public transportation makes it possible for people to travel without paying for their own car and gasoline and is therefore a crime against the DMCA and should, according to some experts, be considered Unamerican. In some countries, mostly those in the third world that do not need to support oil companies and car manufacturers, public transportation is (unlike in USA) not given the role of giving the homeless a place to urinate. This is why the streets of France run yellow with pee. It is important to realize that not all societies can accept a system where even the suburbs of large metropolitan areas are served by a network of bus traffic and subway systems. Quite the contrary; when such a system makes it possible for people to travel in a relatively cheap and efficient way, the economic implications are too terrible to consider (again, see France). To protect the economy, all civilized nations that have been forced by Communist infiltrators to implement public transportation systems ensure that the physical infrastructure of the transportation facilities is made painful to use, and reinforce the inconvenience with extensive mind control radiation and terrorism threats. The worst threats towards Decent American car industry as we know it: Efficient European-style public transportation and cheap Asian cars that may look a lot like something your average g0d-fearing, f4gg0t hating suburban family father would enjoy driving. The traditional means of placing advertisements in public areas was proven by Oscar Wilde to be not effective enough to make up to the economical loss of people not consuming any products while traveling. Only in the last decade or so telecommunication devices have slowly made it possible for people to consume while sitting on a subway train. This consumption is usually consisting of the travelers making phone calls or browsing the Intarweb on their cell phones or listening to music or ebooks purchased from the iTunes music store on iPods. This change has been welcomed by environmentalists who previously have insisted that the consequences of having large percentages of the populations of major cities sitting in their own vehicles in traffic jams for hours with the engines running (thus consuming at least some gasoline) not being acceptable. Welcome to the fine world of public transportation. The first step to enjoying this service is to go to a designated station. These stations can be found in the most inconvenient places possible. Some of the larger stations feature a hot dog stand but mostly you must be content with a half-roofed shelter. You would have noticed at least one sheet of broken glass. These art exhibitions are donated by the local homies and assure you of the station's credibility. It is a requirement for you to scratch your name into the station somewhere so the government knows who to overtax for your unpatriotism. Then you must wait for the bus/train. Depending on your luck you will have to wait anywhere between 10 minutes and 3 weeks. The public transport company decides when to send trains down the track while sitting in their office. Due to the incredibly low budget, they must rely on their magic 8 ball to decide when trains are to be sent and what tracks they are to go down. While on the train or bus, you must pay the bus driver 7 cents. 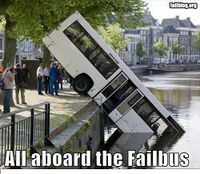 finding the bus driver is quite tricky as he looks very similar to the rest of the passengers on the bus. He will be drunk, have 4 teeth, 5 words of English and half his lunch down his shirt. However, unlike the rest of his passengers, he has not yet accepted that driving is beyond his mental capabilities’ and will most likely be at the front of the bus, talking to one of his few, unfortunate friends on his cell phone. Many bums live on public transport. They are usually asleep. It is best if you don't wake them up. If they ask you for money, don't give them any. They will identify you as a easy target and never stop following you. It is recommended that you hold onto the seats as tight as posable as using seatbelts is strictly prohibited on the bus. Do not wear your best trousers on the bus/train. All the seats are coated with a thick layer of piss and chewing gum in order to deter the homeless from eating them. Do not sit at the back of the bus or train unless you are a bogan or wish to be beaten up by them or worse, mistaken as one and be forced to listen to AC/DC and have a conversation about beer using a limit of 5 different words. It is against the law to speak to anyone on public transport. This gives extra time for the users of public transport to stew in their sorrow and hopefully die of cholera. After leaving the bus or train, you must avoid eye contact with anyone who didn’t ride public transport. Otherwise you risk a bad case of mild humiliation for at least a few hours after leaving the public transport system. Congratulations! Secure you valuables and put on your bulletproof vest. You are now ready to ride on your local public transport system! misuse of the ticket machine. During the early 00s large American companies like General Motors and Ford have with some success lobbyed against laws making it legal for car owners living in communities offering public transportation to do some travelling with vehicles not owned by themselves. Legalisation of driving free days is still a controversial political issue in parts of the western world, due to the common fear of that some people might forget how to drive safely if not praticing to improve their driving skills every day. This particular belief have however been discovered to be an urban legend started by corrupt journalists. By the Misuse_of_Bus_Act_1971  public transport vehicles are separated into classes A,B and C. The penalty for possession of a Class A bus is 7 years and an unlimited fine. Unfortunately, such offenses are difficult to prosecute. There is no fixed number of passengers nor gross weight which distinguishes personal use from bus dealing. This page was last edited on 31 August 2012, at 06:13.